Avoiding direct conflict was especially important during the Cold War, where armed provocation could've lead to a nuclear exchange. Thus the infiltration missions that occurred during that period were all about monitoring and non-confrontation. In 1962, for example, the CIA parachuted operatives onto the Arctic pack ice to raid a Soviet listening station and exfiltrate via Skyhook - but they waited until the station was abandoned. The Soviets mounted a similar arctic operation to recover microfilm from a downed spy satellite. Apart from proxy conflicts, the Cold War was largely fought with binoculars, microphones, and camera lenses rather than guns. Ground Zeroes emphasizes that point by telling the story with tape recorded conversations rather than the series' infamous cutscenes. Though Kojima probably instituted them to save on the animation budget, the tapes are an inspired choice that makes absolute sense given the Cold War setting. Instead of a narrative that plays out in real-time, players have to piece together the mystery of what's happened at Camp Omega, putting together fragmentary information until it forms a picture of Skull Face. 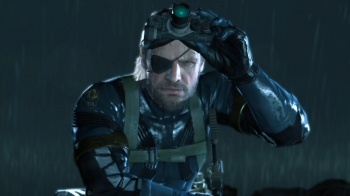 In doing so, Ground Zeroes casts the player as an intelligence analyst, trying to understand and come to grips with an enemy that's only encountered via the evidence he leaves behind. (Audio logs are also a great way for Kojima to slake his thirst for monologue.) This investigatory narrative - whether required by budget constraints or not - calls up memories of John Le CarrÃ© novels and foregrounds the fact that espionage is about what you know, not who you kill. Which is why it's so frustrating when two of the side missions devolve into run-and-gun fests that spoil the game's tone. One can make a good faith effort to stay hidden while taking out anti-air defenses - it takes some doing, but it's possible - but the helicopter assault feels entirely out of place. It doesn't fit with the story at all, fails to leverage the observation and sneaking mechanics that make the game fun and doesn't give the player room to explore. Instead, we're treated to 15 minutes of underdeveloped firefight mechanics - because while Ground Zeroes may pretend it's an open world game with many approaches, stealth is the superior option. The game flat out tells you that by docking points for every kill. Look, we get it, Ground Zeroes you're a digital kill house we're supposed to play over and over as training for The Phantom Pain. But if you're going to grade us, don't throw in missions that don't fit the rubric - that's not fair. And that's not the only time Ground Zeroes fumbles its new mood. Unfortunately, as the game progresses and you dig deeper, it's clear that this new MGS - set in the Cold War but grounded in the War on Terror - has a nasty side. The stabs at relevancy and emphasis on real-world spying strips away the sillier feel of previous games. There's a cutscene that crosses a line, taking the series into darker, more violent territory than it usually visits. One audio log hints at something grotesque done to a child. Now, it's true MGS has always been about the transformative power of wartime trauma. Most villains, from Sniper Wolf to the Beauty and the Beast Unit, have war-torn pasts that made them who they are. Like Godzilla, they're monsters born from the inhumanity of 20th century warfare. The difference is that in previous games there was always Kojima's pop-culture everything-and-the-kitchen-sink sensibility to serve as a buffer zone and create distance for the audience. In Ground Zeroes, there's only one classic Kojima villain - and he steps on a helicopter and flies away before the game begins, taking our accustomed layer of absurdity with him. What remains is a story of torture and illegal detention that, while fact-based and not lacking an emotional punch, doesn't have the manic glee I associate with the series. The environmental storytelling in Ground Zeroes is smart and precise, letting the player condemn Camp Omega from what he or she witnesses rather than a listening to a preachy lecture - but I hope that this naked outrage isn't what a full-length Phantom Pain will be like. Who knows? We'll see in a year. Until then, I'll be sitting in this guard tower, scanning guard patrols, planning my next grab and calling for extraction. There's still information to find.